Countries of the world KML file, download for free and it can be use for any purpose, the file is a KML polygon file of the countries in the world in the Natural Earth datasets. I generated the file with SAP ABAP which reads the Natural Earth country shapefile in my geoserver in the clouds. More about this later. *The Natural Earth Dataset has French Guiana with the ISO code for France. The ABAP code reads the ISO code to determine the colour of the polygon. More thematic mapping to come. I used geoserver to produce the KML shown above. A blog about my adventures into GEO/KML and SAP can be found on the SDN site here. 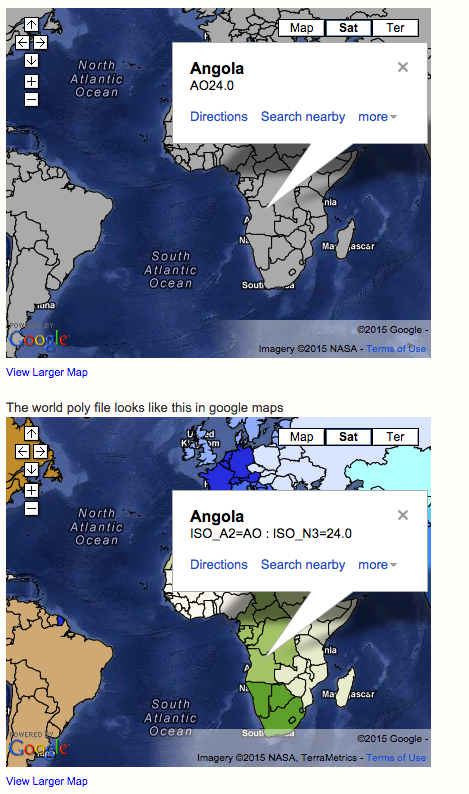 The main difference between the world poly file and the raw file is in the XML markup and colours found in the KML. The RAW kml file is produced by geoserver containing the ISO codes of the countries. My ABAP program generated the polygon colours based on UN data for the world poly KML file. So I have taken a static screen shot to show the differences between the two KML files below. how do i get the kml file? The raw file is shown in Google maps below and can be downloaded here"
Great resource.. Thank you verymuch! Absolutely awesome job and very helpful resource. Thank you! definitly awesome. You've done a great job! Thank you! I know this content is super old by internet standards, but I think Russia isn't quite right in this KML. Apologies for the long delay in posting and replying to your message, I was on holiday when the comment was posted and I have only just returned. I agree the post is quite old now :) but let me know in a bit more detail what you think the issues are and I'll try to have a look at it soon.